Idea: Make something smaller and something larger, with the aid of buttons. I made this dress from scratch last winter. I drafted a new neckline. I adjusted it for full bust, swayback, short waist, petite height and shoulder adjustment. It is made of expensive wool and is fully lined. It was perfect. And then my bust became larger. Argh! Before. I wear it with the back zipper open. I was inspired by this dress. 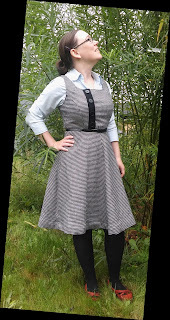 - I cut the bodice open off center to the right. - I stitched a strip of extra fabric ontp the left side of the opening. - For the placket I used a wool remnant from another project.I finished it and stitched it to the right side of the opening. 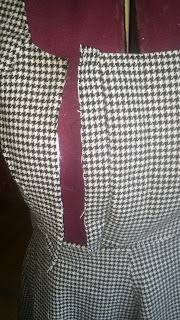 - I stitched the opening back together (the placket is not functional), and lastly I sewed four large buttons onto the placket. 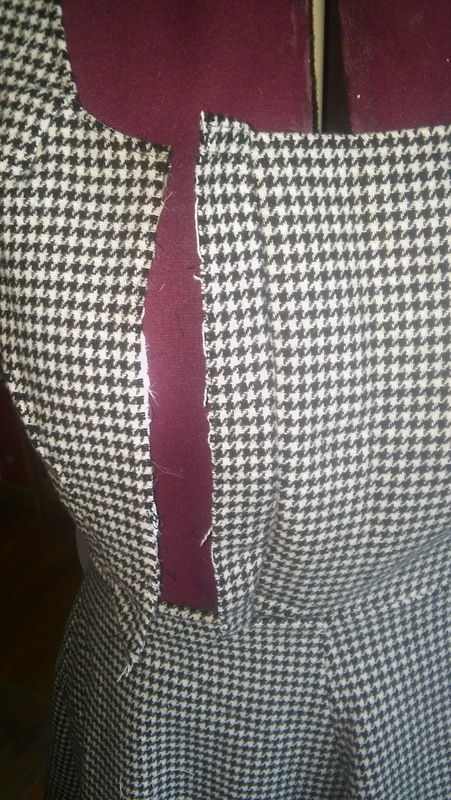 I eased the extra fabric in the bodice out into the edge to the skirt and closed the hole. After. 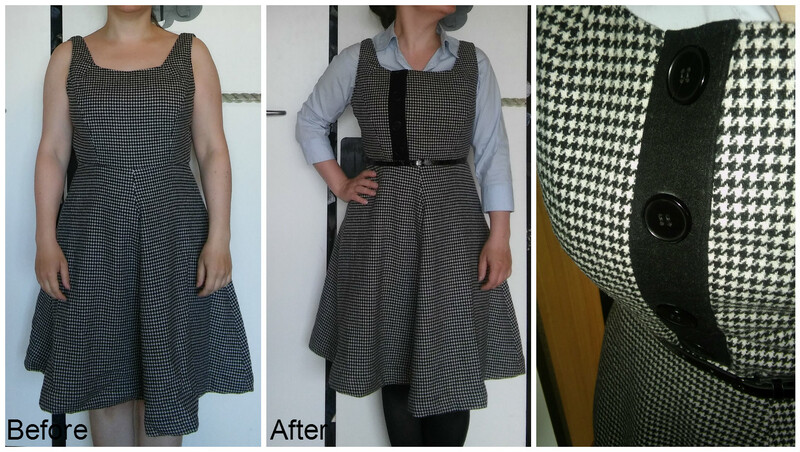 Since it is a wool dress, I winter styled it (which was warm to wear, even though summer here isnt particularly warm this year). Before. 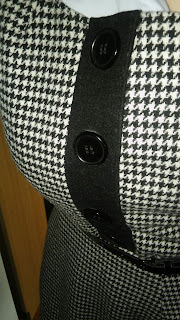 A very large houndstooth skirt. 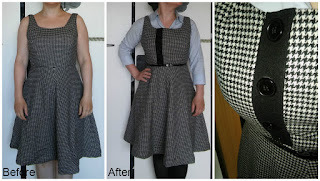 I swear, it is a complete coincidence that this skirt has the same pattern as the dress. 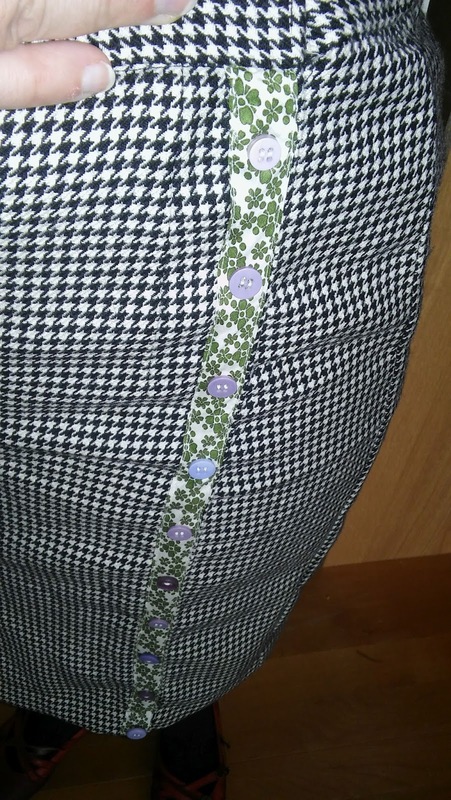 The skirt was simply the garment in my stash that fitted the idea best. 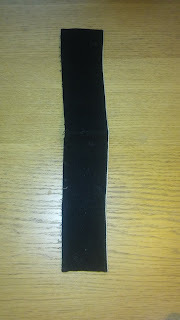 - I made a pleat, that swallowed the excess fabric, and stitched it down. 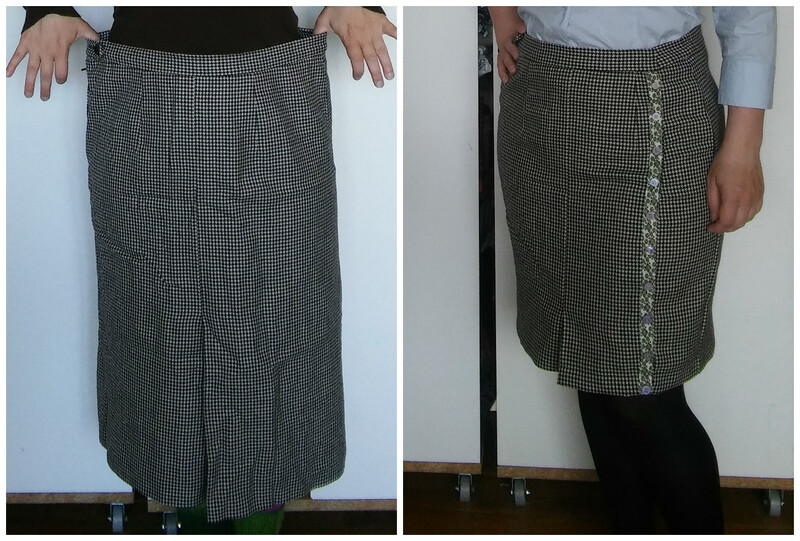 - I shortened the skirt by 20 cm (8"). 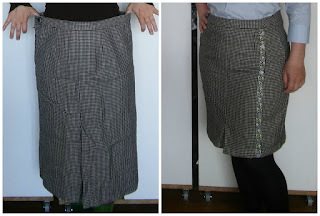 - I tooks the skirt a bit in at the sides to fit me better. 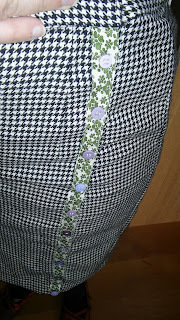 - I stitched a viscose (rayon) ribbon on top of the pleat and then added buttons to resemple a button closure. 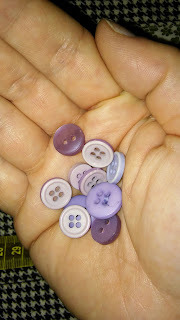 All the lilac buttons in my button collection (do you feel my pain? 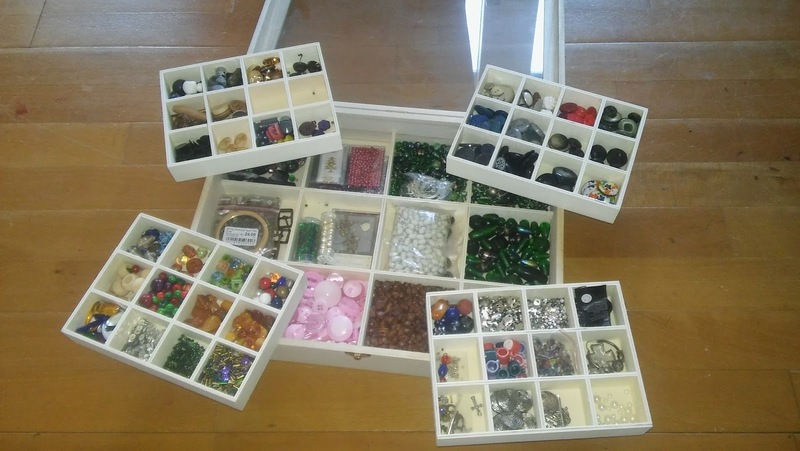 I treat my button box as a pirates' chest...). I love both of these projects. The off center placket on the dress is adorable. It added a little spark to the look. It's a great idea for adding fabric too. Both refashions look great, very well fitting. 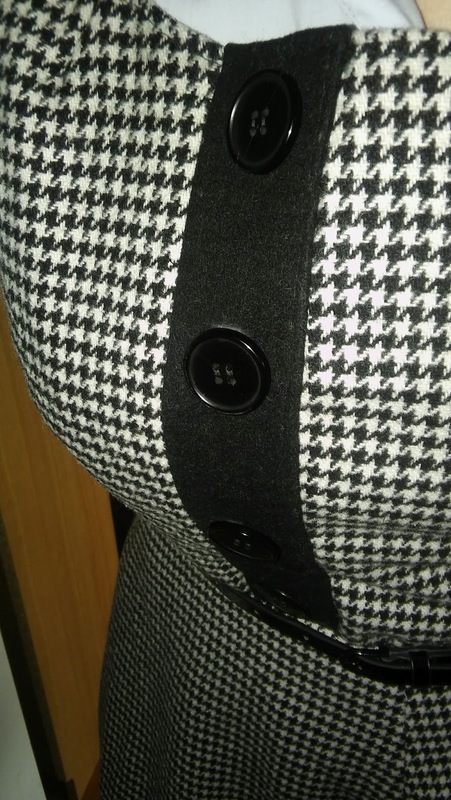 I really like the buttons on the dress. They make such a difference.